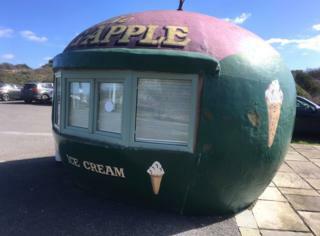 A distinctive 1930s ice cream kiosk which was painstakingly repaired after a car crashed into it 10 years ago has been granted listed building status. 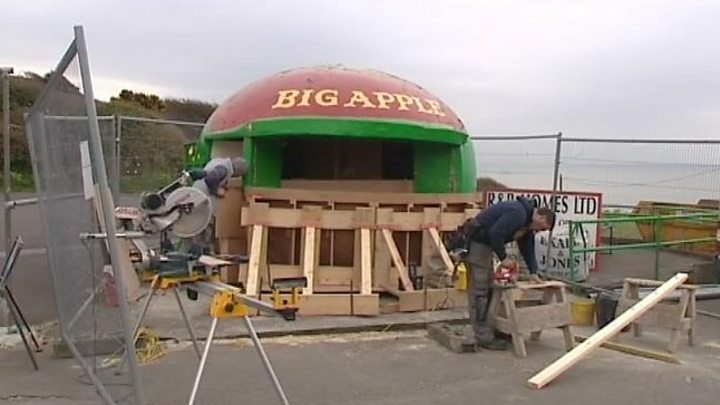 The Big Apple at Mumbles has been one of Swansea's most recognisable landmarks for generations. The Welsh Government's heritage arm Cadw said it was a "rare and unusual" example of a seaside refreshment kiosk. Bert Bollom, from Mumbles Pier owners Ameco, said it was "really pleased" with the recognition. The granting of listed status follows a campaign by local supporters. Cadw said the elliptical concrete building had "special architectural interest" and was an "iconic feature from the heyday of seaside entertainment". The kiosk was built in the early 1930s to promote a cider brand called Cidertone. Others materialised in coastal towns in the UK, including Porthcawl, but Mumbles historian John Powell said the kiosk in Bracelet Bay was the last one standing. On hearing about the listed status, he said: "I'm very pleased. It's a wonderful, popular tourist attraction. "It gives you a lift every time you see it," he told the Local Democracy Reporting Service. The Big Apple was shaken to its core when a Ford Fiesta ploughed into it in August 2009, causing extensive damage. But it was rebuilt and repaired, with 27,000 people backing a campaign on Facebook to safeguard its future. Mr Bollom, whose company owns the kiosk along with Mumbles Pier, said the rebuild job was very testing. "No-one knew how to do it!" he said. The kiosk suffered an earlier indignity in 2006 when pranksters painted it orange. Belgian waffles sold by Victor Frunza were one of the kiosk's best-known specialities, but some traders have struggled to make a living from it. The kiosk will not open this year because the adjacent car park may be needed for storage during redevelopment of the pier and foreshore.